Welcome to a very special section of Brian Marki Fine Art: "Sandro Negri”. Brian Marki Fine Art exclusively represents Sandro Negri both in the United States and globally. Both Brian Marki Fine Art in Portland and in Palm Springs exhibit works by this distinctive artist. In 2012, just as Brian Marki was preparing a special exhibition from Sandro's personal collection, the artist died suddenly at his home in Italy. The posthumous exhibition, Archives, became a wonderful overview of Sandro's life and work. About the same time, an article appeared in the , an Italian newspaper, about the collaboration between Sandro and Brian. Although the world bid farewell to Sandro, Brian Marki Fine Art continues Sandro’s vision by offering much of the remaining works by this fine artist. Sandro's art has been described as Fauvist and Expressionist. We call them Joyous. No matter what you may call them, each painting reflects his joy for life, his passion for his work and his love of his native Italy. Sandro Negri was born in 1940 in what he describes as "the month of Sunflowers"— and he was born to make art. He began life in the northern Italian farming village of Virgilio, where he drew the things he saw around him. As a child, he was always drawing on the pavement of the narrow streets and on the whitewashed buildings so indicative of the village where he grew up. With the onset of World War II, Sandro would be separated from his parents who were forced into labor camps. His formative years were spent on the farmlands of his grandparents. Living there helped to shape Sandro’s relationship with nature and strengthen his work ethic, both of which would become important in his career as a painter. 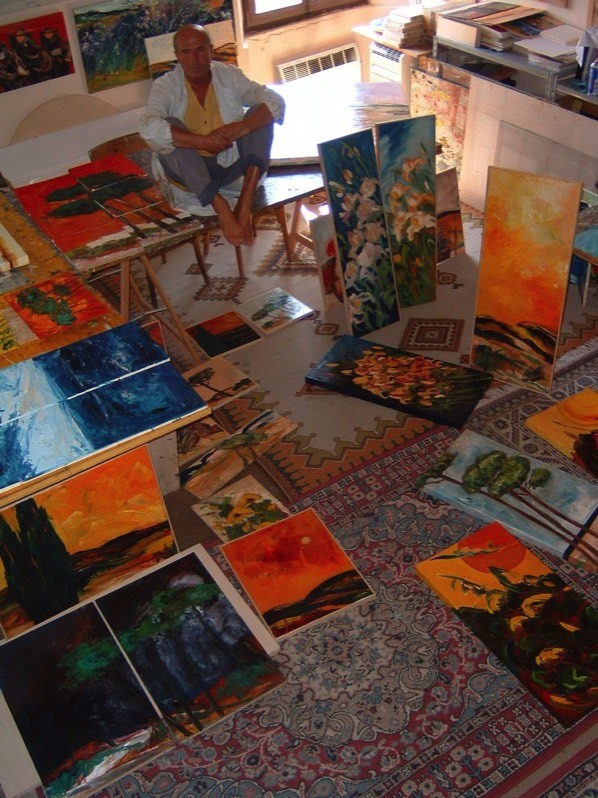 Although not formally trained, Sandro immersed himself in the exploration of oil painting and painting techniques. His study of artists such as Mario Sironi and Ennio Morlotti informed his painting style. His early painting style can be described as melancholy and monotone in the chiarissimo style. He was working as an X-ray technician when Italian director, Cesare Zavatinni, spotted his paintings on the examining room wall. Zavatinni, leader of the Italian Neorealism film movement, liked what he saw so much that he not only bought the work, he arranged for Sandro’s first exhibit in 1970 and the start of his successful art career. Sandro’s fame grew beyond the Italian border, and he was soon exhibiting throughout Europe including France, Holland, Sweden, Spain, Switzerland, England, Germany, Russia and Austria. Sandro published his first monograph in 1976 and eventually was exhibiting in the United States and Canada. By 1984 Sandro began to have museum shows with his first show at the Museo Archeologico e Arte Contemporanea Virgiliano Andes Virgilio, Mantova Italy. He would continue to collaborate with other artists such as Robert Altman and Dino Villani. In later years, Sandro established a large archive collection of his work at Palazzo Cavalcabo in Mantova. This would become a repository for work that Sandro felt to be significant in both formal terms and content or subject matter. The palazzo would become a place of refuge and creativity where Sandro could paint as well as host patrons and collectors and continue the process of exhibiting in the United States. In 1997, two drawings were purchased for the Vivian and Gordon Gilkey permanent collection at the Portland Art Museum. A thirty-year retrospective exhibit of Sandro’s work was held at Casa del Mantegna in Italy in 2000 and a lush catalogue was produced to accompany that exhibit. Until his death in the summer of 2012, Sandro worked in the restored villa, where he encountered some of his favorite subjects—the flowers, fields and inhabitants of the Italian countryside.